Amid UN warnings of the dire humanitarian situation in Yemen, the BBC's Orla Guerin has overcome attempts by Saudi Arabia to block her team from entering the country and has seen for herself the depth of the suffering. Yemen's health, water and sanitation systems are collapsing after two years of war between government forces - backed by a Saudi-led coalition carrying out air strikes - and the rebel Houthi movement. The conflict and a blockade imposed by the coalition have triggered a humanitarian disaster, leaving 70% of the population in need of aid. Orla has been tweeting about what she saw. In a hospital in Aden, Orla saw staff battle to save the life of an elderly cholera victim - Abdullah Mohammed Salem - who was brought into the building without a pulse. Hundreds of thousands of Yemenis have contracted cholera in recent months, making it the worst outbreak in history. Hospitals are overcrowded and severe food shortages have led to widespread malnutrition, making people - especially children - even more vulnerable to the infection. Some 60% of Yemenis do not know where their next meal will come from and the World Food Programme is warning of the danger of famine. 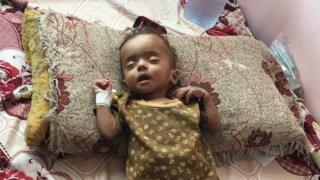 Doctors told the BBC that Yemen was in danger of losing its future, with 500,000 children now severely malnourished. In two years of war, houses, hospitals and schools have been destroyed by Saudi airstrikes and more than 3,000 civilians have been killed. Some people are living in the rubble of what were once their homes. Yet despite the destruction, no side appears close to a decisive military victory. Pro-government forces - made up of soldiers loyal to internationally-recognised President Abdrabbuh Mansour Hadi and predominantly Sunni southern tribesmen and separatists - stopped the rebels taking Aden. Mr Hadi and his government have returned from exile and established a temporary home there. But they have been unable to dislodge the rebels from their northern strongholds, including the capital Sanaa. The sides have drifted into stalemate - but the human suffering continues unabated.